Or, more properly, how much CO2 in the atmosphere can we, as humans, tolerate? To cut its greenhouse gas emissions by 40% by 2030, compared with 1990 levels. 27% of energy must come from renewable sources by 2030, which is described as a binding target as well as being described as "not yet clear whether the target will be binding at the level of member states". No new legislation to regulate shale gas development. Reformation of the EU carbon trading scheme. There is an article at the Guardian by Fiona Harvey and Ian Traynor that describes the EU's new targets in a bit more detail and provides some context. For example, at one point they write: "Studies show that the EU's emissions are likely to be 25% below 1990 levels by 2020, making the targets easier to meet." It's not a done deal yet. It is still to be debated by member state governments, which I gather will be happening during March this year via the European Council, and the European Parliament. Given that some countries are forging ahead with emission reductions through renewable energy development and other means (eg energy efficiency), I gather that the emissions target and the renewables target are thought to be achievable. The plan may be thought by some people to be ambitious, certainly compared to targets in other places, but is it enough? To keep global temperatures at or below two degrees of warming (ie two degrees above temperatures of the beginning of the twentieth century), we need to limit the total amount of carbon emissions from all sources to around 1000 GtC or less. The interesting thing is that there is a robust relationship between temperature and emissions. The temperature response to carbon emissions has been shown to be linear up to around 2,000 PgC. It doesn't matter over what time period or what the resulting CO2 concentration is. That's an important point, so I'll repeat it. Whether or not we emit the next 500 gigatonnes of carbon over a decade or over a century, the temperature will rise the same amount. And it doesn't matter if atmospheric CO2 goes up by double or a bit less or a bit more. The relationship we're talking about is between emissions and temperature not CO2 concentration and temperature. That is why the focus is shifting away from concentrations of CO2 to carbon emissions. the observational record showed a mean value of 1.5°C per 1000 PgC emitted, and a 5–95% range of 1 to 2.1°C/1000 PgC. I doubt the 1.5°C observed rise factors in slower feedbacks. So I suggest adding a half a degree at least. This is a moving target because we are still increasing the rate of growth of emissions. The EU targets and those of all other countries need to be assessed in the light of how much they will add to cumulative emissions. If we don't keep cumulative emissions to less than 1,000 gigatonnes (1,000 PgC) then temperatures will be likely to rise above 2°C. Obviously there needs to be a cooperative international effort to limit cumulative emissions. That's not to say that all countries have to have exactly the same route to reducing emissions. It is to say that taken together, the whole world needs to keep cumulative emissions to less than 1,000 gigatonnes of carbon. With cumulative emissions approaching 500 gigatonnes and carbon emissions currently at around 10 gigatonnes a year and rising, it doesn't leave a lot of time to switch away from burning fossil fuels, such as by switching to clean energy. This involves a massive change in electricity generation for example. Thing is, we need to leave some spare capacity for future emissions even after we make the major switch away from burning fossil fuels. Remember, this is a cumulative budget. Even when we cut annual emissions to around 10% of what they are at present, we'll still be adding at least ten gigatonnes a decade to cumulative emissions. If we use up all the budget now, then future generations will be much more limited in their options. 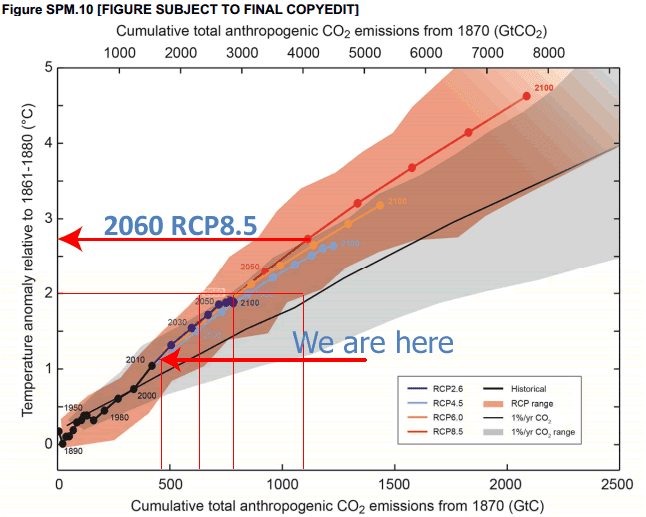 The chart above shows how much time we have or not, depending on which emissions pathway we choose. But really, in the short term (say, to 2050), unless we make radical cuts in emissions in the next few years, we're heading for more than two degrees of warming this century. If you took the cumulative emissions by the end of 2014 to be 500 gigatonnes and assumed a 2% growth in emissions each year, then we'd have reached the 1,000 gigatonne target by 2050. Even if we were to stabilise emissions at the current approx 10 gigatonnes a year, we'd fill the 1,000 gigatonne quota by 2070. After that we'd have to stop all emissions immediately to stick to the budget - which just won't happen. So the sooner we start to reduce emissions the better. Maybe Damian doesn’t understand that whole “parts per million” thing, if he did, he’s certainly know that 398.58 is nowhere close to “half full”. The value of 500,000 parts per million is what would be considered “half-full”. He’s only off be a couple orders of magnitude. Maybe he was thinking in terms of saturation of the CO2 effect in the atmosphere on temperature? In that case, we are closer to 90%, and additional CO2 won’t make much difference. No, Anthony. You are very wrong when you claim "additional CO2 won't make much difference". You are also wrong about what Damian was thinking. Damian was referring to the cumulative carbon emissions budget, as you'd have realised if you'd read the article to which he linked. This graph showing CO2′s temperature response to supplement the one Doug Hoffman cites from IPCC AR4. here we see that we are indeed pretty close to saturation of the response. "Close to saturation" is a relative concept. There is plenty of room for temperatures to rise and cause untold damage. (Note that Anthony's chart stops at 800 ppm. Plus he's got the Y axis at a scale that makes reading associated temperatures difficult, and hard to determine if his chart resembles reality). Thing is, of course, that we're heading for much more than a doubling of CO2. If we were to continue to increase emissions by two per cent a year, then by 2040 we'd have doubled the CO2 concentration in the atmosphere assuming that half the extra emissions continued to be absorbed at the surface. Sooner if the oceans reckoned they'd already absorbed more than they could handle. By the early 2060s CO2 would be up to around 800 ppm. And by 2100 we'd be over 1500 ppm. In terms of the carbon budget, that would take cumulative emissions to almost 2800 gigatonnes, which is off the chart (of the top chart SPM.10) and getting into the territory of six degrees of warming by the end of the century. Not a pleasant thought. In the meantime, fasten your seatbelts. It's going to be a rough ride over the next few years. Matthews, H. Damon, Susan Solomon, and Raymond Pierrehumbert. "Cumulative carbon as a policy framework for achieving climate stabilization." Philosophical Transactions of the Royal Society A: Mathematical, Physical and Engineering Sciences 370, no. 1974 (2012): 4365-4379. I believe that by 1/2 full, he meant that we are 1/2 way to a ‘safe’ level of CO2. From pre-industrial levels of 260, that would mean we are at 390 (we are), and must go no further than 520. Sadly it isn’t just this guy off his rocker – it is the EU mass insanity driving themselves into poverty led by an even crazier class of leaders without a gain of common sense between the entire lot. Genuine science has ceased to exist in the entirety of the EU – replaced by a self imposed dark ages eagerly followed by the masses. Given the atomic weights of carbon and oxygen, isn’t the total carbon in the atmosphere actually closer to 0.015%? He thought it’s 398 percent, not ppm. And 398 percent is about half full. Quite a good one from the Guardian. thebleedingobvious is right when he says CO2 isn't the same as carbon, but not right when he suggests that "alarmists" always use the wrong term. As he rightly points out, CO2 is not the same as carbon. However total carbon includes the carbon in CO2 (and CH4 and other molecules containing carbon). Carbon dioxide is not the same thing as carbon. Why do alarmists use the wrong term? The answer is simple: because they are scientific illiterates, who are just repeating the standard talking points given to them. Since the ideal CO2 level is probably somewhere around 1,000 ppm, at close to 400 ppm we still have about another 100 ppm to go before we’re at half full. But, close enough. Burning more coal could help us get there. A few million years ago, the atmosphere had almost ten times as muchCO2 in it compared to today’s atmosphere. The idea that the atmosphere is half full is something so dumb that only someone completely in thrall to his religion could believe it. Anthony, do you have the source for the chart at the end of your post showing the temperature response to CO2? Anthony's "link in the story" is no help at all. It doesn't provide any source of his chart either! That just makes the stupidity even more appalling than the ignorance: Half of a maximum addition to something is not in general the same as half of the total amount. I'm never quite sure what people are trying illustrate when they point out articles about energy policies that may or may not be harming the economy. In what way does this influence (or not) the science associated with global warming and climate change? In my view it doesn't, but maybe you have more insight than I do. Well, as the article mentions the EU I thought it might have been of interest to see what the effect carbon taxes are having on one of the EU's largest economies. They are starting to hurt individuals and businesses, It will influence the science when cuts are made to funding. This is probably the wrong forum, I will most likely be accused of 'thread-bombing' or 'trolling'. Is there only room for part of the debate on here? This article is in part about carbon policy, so comments about policy are in order. The switch to clean energy will come at a price. Almost any industry restructuring has initial costs. Thing is, the benefits far outweigh the costs as they often do in industry restructuring. In Australia there are from time to time major restructures of industries. The costs have included recompense to people to leave the part of the industry that's being wound down and incentives to people moving into the newer industry. I'm most familiar with this being applied to the agricultural sector - dairy (removing subsidies and rationalising the sector from dairy farming through to manufacturing), wine grapes (removing uneconomic varieties of vines) etc. Other industries come to mind too, like the clothing, textile and footwear industry (tariff reduction). Industries given incentives have included aluminium smeltering (subsiding electricity costs and building infrastructure), the auto industry, the electricity generating sector and biotech. Plus R&D incentives for various high tech industries. In the case of the costs of shifting to clean energy and improving energy efficiency, the costs of not doing are much more far-reaching and long-lasting than a few decades of auto manufacturing or the life of a power plant. What we do or don't do now will be affecting societies in the near term but will also affect humanity for thousands of years. If we don't make the shift we threaten not just social stability, but the longer term existence of societies as well as the existence of most species. Humans will survive but most people hope for more for the future than mere "survival". BTW I believe the economy in Germany, with it's move to cleaner energy, is a lot healthier than that in, say, Poland - with it's dirty energy. Yes, it's not as simple as that. But Germany and many other European nations are showing it can be done. Many less developed nations are benefiting from developments in renewable energy technology too, being able to bypass a lot of the ills of dirty energy and installing renewables as the first electricity they see. Think solar in Bangladesh, India and many parts of Africa. Local solar is being introduced as the first electricity generation millions of people have seen - or replacing diesel generators - which are dirty and costly. And getting access to locally generated electricity without the cost of expensive distribution networks. This is probably the wrong forum, I will most likely be accused of 'thread-bombing' or 'trolling'. Is there only room for part of the debate on here? Apologies if my comment came across like that, but I was looking for some more context. It will influence the science when cuts are made to funding. This may be true, but that's not what I meant when I was referring to "the science". The point I was trying to make (and as Sou says) we can't switch technologies without it costing something, but simply showing that the current policy is having some negative effects, doesn't immediately imply that trying to switch to a low-carbon economy is somehow the wrong thing to do. The scientific evidence suggest we'll continue to warm. More heatwaves. More precipitation in the regions that are currently wet. Drier in the regions that are drier. Changes to extreme weather (precisely what may be hard to predict). The point is that one has to balance the risks associated with the various policy options with the risks associated with various emissions scenarios. That changing our economic model isn't going to be easy doesn't mean it's not still the best option. Also, just because the current policy may be damaging also doesn't mean that all possible options are damaging. We shouldn't, in my opinion, associate poor policy options with the scientific evidence. We shouldn't, in my opinion, associate poor policy options with the scientific evidence. That's a crucial point you make, Anders. I think one reason many people try to undermine the credibility of science (and scientists) is because they don't like what they see as any policy option. If instead these people contributed to developing policy, the world would be a lot further ahead and the costs of the shift would be much less, because we'd have already moved much more quickly than we have. And they'd have the satisfaction of getting policies that were more to their liking. The longer we dilly dally the more it will cost. Europe is being smart. Those nations that have already made big changes and got off the starting blocks sooner will be a lot better placed than the slow movers. Here in Australia, South Australia has moved ahead in leaps and bounds with wind energy. Wind power is getting very cheap these days. Tasmania's always relied heavily on hydro, so it's okay. But Western Australia and the eastern states are heavily invested in coal still. NSW is probably the worst with its heavy subsidies of coal-fired power generation. Victoria is really bad too, because it has the dirtiest coal of the lot. Australia is not doing well at the moment, largely because it's not prepared to bite the bullet and get replace older technologies. We'll have to do it sooner or later and the longer we leave it the more it will cost. It is utterly delusional to think that intermittent renewables will have a significant impact on lowering CO2 emissions. The technology is not now, nor is it foreseen, to provide a basis for affordable, reliable power delivery. Renewables are too simply too limited and environmentally damaging to be a suitable path forward. It should also be noted that Germany is offsetting the high cost of renewables, filling the gap left by the German nuclear phase out by building more coal plants. If we want to exit nuclear energy and enter renewable energy, for the transition time we need fossil power plants. At least 10, more likely 20 gigawatts [of fossil capacity] need to be built in the coming 10 years. Germany's per capita emissions are twice those of neighbour France, and this will remain so for the foreseeable future. If the goal is to reduce emissions, renewables are clearly not the way to achieve it. There are viable options , but apparently not the genuine will to pursue them. When I read you comments, especially in conjunction with those of last night the other discussion thread, I am unclear as to what you are really saying. Is it that you feel that there is a problem that cannot be solved? Or is it that you do not believe that the politics/policy issues can be addressed? Or is it that you don't believe there is a problem that needs to be addressed? Since Sou advises this thread is about policy, and you have asked me a direct question, I will try to answer succinctly (for fear of being accused again of trolling/threadbombing, whatever). Firstly to avert further accusations of stupidity and ignorance, my background is in science and engineering, and I come to the discussion with qualifications in pure and applied maths and physics, fluid and thermodynamics and environmental engineering. A close relative has given me rare insight into nuclear fission R&D in Australia, having been involved in building a prototype centrifuge enrichment facility, part of an Australian world-first nuclear fuel leasing program (an anti-proliferation initiative) which was cancelled in 1984 when the program was nearing readiness by Bob Hawke – ironically a deal with the coal mining unions. I have been aware of AGW for over 30 years. My personal view is that it the problem is very likely overstated (by alarmists) and understated (by sceptics). In short, we face an unquantified risk in the future, and our response should acknowledge that. So how do I rationalise a policy approach? Current climate science (as reported in AR5 and SREX) is suggesting currently a connection between AGW and extreme weather events such as floods, droughts, cyclones is "unlikely" and I would also argue a lower ECS , but I acknowledge it’s debatable. The trend is toward a position that in the short-midterm (50 years), AGW is not a serious problem relative to the issues of poverty and overpopulation. AGW may even be potentially beneficial. However longer term (50-100 years and beyond) there is a problem - the projections for future CO2 emissions from developing countries is very high, and this could represent a problem. It would be wise to take a precautionary approach. The current process of trying to reach international agreement, price carbon, move to renewables etc. are not working. Renewables, whilst seductive in concept, are too expensive and technically limited to make a difference to emissions, particularly in an increasingly financially constrained world. If we wish to take any action to stem the rise in CO2 emissions, then we should be planning over a century, and implementing on a no regrets framework using all available technologies. <a href=" http://blog.hotwhopper.com/>Yelling at “deniers”</a>, and pushing for solar and wind power, are both pointless activities. The best environmental outcome will come from investing over the next 50-100 years (we have time) into <a href=” http://bravenewclimate.com/integral-fast-reactor-ifr-nuclear-power/ “>new, sustainable, safer nuclear fission technology (including FBRs, thorium fuel, etc) </a> to encourage developing countries to move to low emissions base-load infrastructure (rather than coal), and a steady move to CNG and electric powered vehicles. Greig, I don't mind you commenting with a proviso. You may have above average intelligence but you have shown yourself to be abysmally ignorant about climate science over and over again on the Gallop thread and the Newman thread. Don't pretend to know stuff you don't. It's okay to write your opinion on policy but I don't want you making any more comments here about the science itself. There's enough pseudo-science websites you can contribute to, so if you want to air any more of your opinions about science do it there. @Sou: Grieg is behaving much better here, and his scientific statement re AGW impacts in the 50-year time frame vs longer-term seems relatively uncontentious. We should embrace the transition from debating crap faux science to mitigation and adaptation strategies. Yes, I agree PL. I'm urging caution because I won't be around a lot this week and I don't want to come back and find there is a lot of nonsense to deal with. 2. However these are not facts, but judgments. Important judgments too, with momentous consequences if they are wrong. Also, THE primary issue in this debate is how we can evaluate judgments that are either disputed, or subject to unpredictability. 3. I particularly like the fact that you put all of this in a wider context – specifically population growth, poverty and (implicitly) issues of scarcity. This context is of considerable importance. As for your subsequent comments I note that you do indeed join with the “policy argument”. However I am less than convinced by what you assert. I note that many countries and regions have achieved major changes in different economic sectors as a result of planned research/implementation initiatives that took several cycles to prove their long term worth (in the case of fuel efficiency were it not for the ensuing competition from foreign manufacturers, automobiles in the US would probably still be consuming massive amounts of fuel). But that subject not for now – it is vast and begs further argumentative confusion. Re population - the news looks good – even if most of us will be dead before it naturally solves itself (c2100)! (Ref: Hans Roslings’ impressive statistical work). Now to my problem with your post: While you say that: “It would be wise to take a precautionary approach” you state that initiatives to date are not working. You seem to infer from this that they should be abandoned. A ghost hovering over much of this debate seems to be covert politics, specifically a desire to ensure that governments are not involved in mitigating climate impacts. This, it seems to me, is just ideology. It is neither science nor risk management and it is subversive of policy-making. If we add irreversibility to the matrix you could even see a “Very High Risk/Impact Column added (for irreversible outcomes associated with earlier inaction). A cautious and conservative individual would want to offset all such risk. We have no problem marshalling massive resources for military wars. Anything can be done if we want to. Two questions arise - do we need and want to? That, of course, is THE issue – hence the need for a mature debate on both the science and climate policy follows. I agree with your optimism on overpopulation being resolved. However as Hans Rosling clearly asserts, the process to be successful involves billions of people rising into a global economic middle class. The result of this will be an unavoidable massive increase in global energy usage. Energy conservation will only offset this slightly, the fact is the future means much more energy use, not less. Global policy on energy use, and a suitable application of a risk analysis, covers scientific, engineering and economic disciplines. Policy would seek to balance several risks. for example, the risk of mandating the use of more expensive low emissions energy includes the impact it will have on slowing the process of resolving overpopulation, and associated cumulative environmental stresses. Regardless of conservatism and caution, it simply isn't possible to "offset all such risk". Considering the momentum of building coal and gas infrastructure in the developing world, you are probably correct is suggesting that a resolution that involves capping CO2 emissions at this stage would involve "marshalling massive resources". The question do we need and want to? is fundamental to policy. On that score, you need to ask the developing nations of this world about how they perceive the risk analysis (population/poverty vs AGW) - apparently they are paying scant attention to the argument for lowering emissions. Sou said: Whether or not we emit the next 500 gigatonnes of carbon over a decade or over a century, the temperature will rise the same amount. And it doesn't matter if atmospheric CO2 goes up by double or a bit less or a bit more. The relationship we're talking about is between emissions and temperature not CO2 concentration and temperature. Thank you Sou, that was an important point that many people (even those who believe in AGW) don't understand. It's the actual quantity (usually expressed in tonnes, or gigatonnes) that matters, not the percentage of CO2 in the atmosphere. Last year, one of the illiterati on WUWT "proved" that AGW was a hoax because "there's no greenhouse effect on Mars, and the Martian atmosphere is 100% CO2." I'll bet this guy thought he was a genius for coming up with that all on his own. Problem is - first of all - the Martian atmosphere does have a greenhouse effect which raises the planet's temperature around 5°C. Compared to the Earth's 35°C from greenhouse gases it looks small, but what matters is the actual quantity of such gases, not the percentage. The Earth's atmosphere is over 100 times denser than that of Mars, which accounts for the difference. The temperature on top of Mt Everest is much colder than at sea level for the same reason. And the atmosphere of Venus is 93 times denser than the Earth's which raises the surface temperature by about 400°C. Of course, if anyone mentions Venus on WUWT, you immediately get assaulted with comments about Venus having volcanoes, or uranium or urban heat islands (OK, I made the last one up). Anyway, you can be sure that no true believer on WUWT can be convinced that the heat on Venus has anything to do with the dense CO2 atmosphere. "Anyway, you can be sure that no true believer on WUWT can be convinced that the heat on Venus has anything to do with the dense CO2 atmosphere." Actually, that's not quite true, but the reason is perverse. Many on WUWT think that the pressure of the Venusian atmosphere directly causes the high temperature of the atmosphere, and they go all PV = nRT to 'prove' it. 'Steve Goddard' is a major proponent of this canard. Open systems and equilibria are mere distractions in their argument, as is the thermodynamic nature of work. Woohoo! Quoted by Sou, my life is complete. One thing is for certain. We are conducting a real, live experiment to find out how much CO2 the atmosphere can take. I hypothesize that it can take an awful lot more than we have been emitting. The effects so far have been a greener planet. But we will see. The thing is that China and India are just getting started with their CO2 emissions. China's CO2 emissions will double in 20 years. India's will increase five fold. Coal use among the two will skyrocket. Coal use will even grow in places like Germany. Then there is the developing world beyond China and India. Do you think they don't want flat panel tvs also? 20% of the world is still without electricity. I suspect that they want it. In the future we humans will be using more energy, much more. And most of it will be generated with coal and gas, for at least the next 50-100 years until the end of the license period of the 100s of new fossil fuel plants being built in the developing world. So if 10x more CO2 in the atmosphere is going to be bad, then head for the bunker because it's coming like a freight train - we *will inevitably* find out how CO2 the Earth's atmosphere can take, no matter how loudly you scream at the "deniers", it is the world's poor rising form their poverty which seal all of our fates. And screaming at them won't work. Rubbish. Like all conservatives you cannot conceive of a future that is different from the past. Your "insights" are infantile and are predicated on denial of climate science. The history of humanity is a history of revolutions against the established order when that order was unable to guarantee the continued prosperity of the majority. And continuing to burn fossil fuels is a major threat to humanity's continued prosperity. With only 0.8C of warming so far, we are still in the "phoney war" stage of the debate. There is still an opportunity for turkeys like Greig to gobble, gobble their denialism. That will not last forever. Just as the fossil fool age of energy production is coming to an end, so is the "golden age" of the climate crank. MikeH, tell all that to the leaders of the developing world, and the world's poor, who are not so happy with humanity's current prosperity. They are not listening to your call for a revolution, because failing to provide cheap energy to the world's population is an even bigger threat to humanity's future prosperity. I've been following you from the beginning, Greig, and I feel like you're finally being honest in that last post. You said nothing about climate science in the post, just about policy. You;ve been trying (in other posts) to contradict the science because it's obvious you feel that there are no good policy solutions...then say the latter because you keep failing at the former. And I feel I have been completely honest in every post. I feel also that it is deeply worrying that people need to constantly accuse others of dishonesty. It is a curious form of paranoia that leads one to believe that there are individuals who are deliberately lying to you, rather than simply expressing an alternate viewpoint that does not match with your own. Correction, I have presented a possible good policy solution . And suggest that accusing other bloggers of dishonesty and that they "contradict the science" is not helpful in achieving that policy. I will resist the temptation to explain how my view does not "contradict the science" as I will respect Sou's request not to discuss such matters in this thread. Greig argues that he is not a climate crank because he accepts that CO2 emissions will have a small effect on climate. Here is a list that includes well known climate cranks who accept the GHG effect but are correctly labelled climate science deniers because their mission is to deny the detrimental effects of CO2 emissions. MikeH, you haven't responded to my previous post addressed to you, and instead resorted to name-calling. It looks to me like you are an ideologue first and interested in Climate Science second. This also suggests to me that those here on HotWhopper who "spotted" you early on had a much better sense of what you were about than I. I took you at your word. But the sequence of posts that followed have shown you to have been less than forthcoming about climate science and evidence. I am not surprised you did not answer my post above. Your solution is immobilism and giving up (but probably you secretly think all will be well). How Quaint. You seem to believe that we live in the best of all possible worlds and that we should leave it alone - a panglossian (and indulgent) orientation in the light of the evidence. For you it seems to be about "... the world's poor rising form (sic) their poverty which seal (sic) all of our fates". So, that's it, we must just "give up" either thinking or acting. A couple of thoughts for you: (1) before WWI neither the future nor the post war period could possibly have been envisioned by all but a few, just as (2) the circumstances leading to WWII and its aftermath would have both been hard to anticipate. But after WWII steps were taken at an international level to address the international problem in the knowledge that post-WWI the West had got it wrong. That necessitated policies. The new order that came from that led to greatly increased wealth, improvements in health, technology and international cooperation. You not only seem to be unaware that this did not arise "naturally", but seem to feel that inaction naturally sort things out. This is just magical thinking. If humans are going to use science to exploit their environment and get to a point where their activities impact across the planet in numerous ways - then it should come as no surprise that some kind of coordination to control negative impacts - whatever they may be - may not only be necessary, but essential. (Think pollution). Cherry picking statistics and evidence to sustain an argument that is based on the premise of inactivity is just a shallow indulgence, especially in someone who claims your qualifications. Firstly, let me just state that I think you have argued unfairly. You asked me a series of direct questions, and I answered stating my opinions, and then you accuse me of being an ideologue. Then you respond stating that we need to marshal massive forces to avert what you perceive as a potential catastrophe, clearly an ideological position where you have taken an extreme position on interpreting climate science. So your accusation is hypocritical. Also you accuse me of being less than forthcoming about climate science and evidence. Sou has asked that we not discuss climate science in this thread so I won’t. However I will defend myself only by saying that you freely admit you are not qualified to comment on the matter of climate science. I therefore suggest you (by your own admission) are not in a position to judge me on that score. My opinion on the rate of expected future warming is not contentious, it is well within the bounds of IPCC projections, and I am not alone in the community (including many well-known climate scientists) that hold this more optimistic view. Having said that I respect your view that perhaps urgent action should be taken. There is indeed uncertainty about the future, and I (and the many climate scientists who agree with me) could be wrong. Considering that, I think you may have misunderstood me. I am certainly not advocating inaction , far from it. Rather I am saying that screaming at deniers and advocating renewable energy is pointless. In order for meaningful change to occur, the case must be made to the developing world protesting their massive increase in coal and gas infrastructure. Also my background has led me to the conclusion that we should be urging a move to large-scale nuclear fission – it is the only affordable low emissions technology we have that can provide for the impending and inevitable massive increase in global energy needs. I'm still laughing about Carrington's choice of term "half-full". Takes naivete and journalistic sloppiness to a whole new order of magnitude. Credibility remaining is in extreme overdraft territory. "journalistic sloppiness" - "a whole new order of magnitude" "extreme overdraft territory". Busted irony meter? Get a replacement here. BTW - if we don't want temperatures to get above 2 degrees of warming, the atmosphere is indeed almost half full as shown in my article. Like it or lump it, with or without journalistic sloppiness, treacle, milk, lemon, butter, margarine or a sprinkle topping. "... sniping at WUWT, HotCopper and other science denying websites". Science denying? Really? Sad. Ok. So we don't like the climate change yes lobby, is that so we can keep making crap and consuming more and more of the worlds other resources? And tell me when its all gone and the trees are burned down to make way for beef and soy. When the rare earths are no longer making money for warloards in Africa. When China has bought up the land in other countries to feed it's ever growing population. When Roundup has poisoned the land and the summer doesn't buzz with the sound of bees. When your children's children have come to the end of the rioting over food and water shortages. When millions of people are landless and homeless and living in your backyard here in the West because you made their lives hell by your greed. Will you have learnt anything? It doesnt matter how much you take. ..it's what you give that counts in the end.